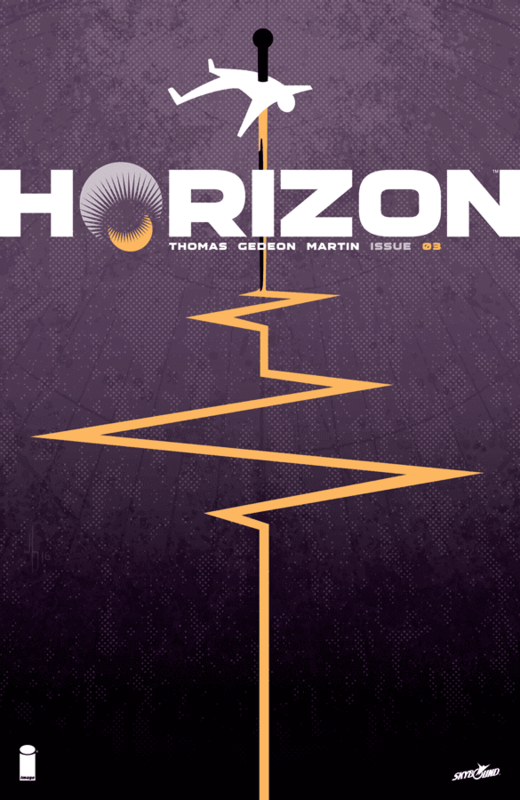 'Horizon' from Brandon Thomas, Juan Gedeon, and Frank Martin has been a great fun sci-fi action movie in sequential art. Gedeon and Martin providing some pulse-pounding visuals in their own unique style. Issue three delves deeper into some character development as Zhia and company attempt a daring rescue of Finn. One of the knocks on this new series has been the light character work so far. Thankfully, we get some more background with flashbacks that are intertwined with the present day. Before Zhia and Finn came to Earth to fight the occupation of their planet, they were flirting with the idea of establishing a relationship but duty called. Now, one's been imprisoned and tortured and the other is racing against time to save him. What 'Horizon' does best is action and there's plenty of it. Gedeon's visceral style rests in mimicking motion - punches, bullets, electric shock - displaying a series of exciting panels. He's one of the few artists that sacrifices details in some of his panels, more interested in the bigger picture, the larger impact of the action than the intricate design of a character's clothing. It pays off especially with the bold color choices Martin paints the scenes with. 'Horizon' continues to evolve with a more a balanced issue providing more depth while still bringing the action. As such, it keeps getting better, finding itself and revealing its purpose and the motivations of its characters. This exciting new title is just getting started and deserves to be on your pull list.